Edited by: Marc Seifert. Series edited by: Wilhelm J.G. Möhlig. 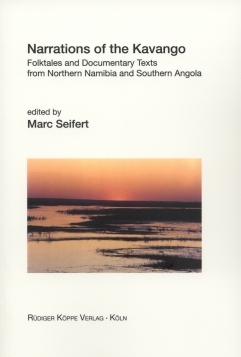 The present anthology contains a collection of 59 folktales of the Kavango peoples Kwangali, Mbunza, Manyo, Mbukushu and Nyemba. They have only been living in their current settlement area on both sides of the Kavango river between Katwitwi in the West and Shakawe (Botswana) in the East, for a comparatively short time. All narratives were recorded on the Namibian side of the Kavango in a period between September 2005 and August 2006. The Kavango river is the centre of life in all respects: geographical, agricultural and last but not least cultural. Accordingly, it is not amazing that it plays an important role in the life of its residents: In everyday’s life as well as in their narratives. The Kavango is the place to live, a source of food and water, a source of myths and dangers. All this is reflected in the narratives of the peoples. All narratives were recorded and transcribed as well as translated mainly in the field in cooperation with the field assistants and the storytellers. They are presented in the original languages followed by an English translation. The translations follow the original as far as possible without destroying the typical character of the folktales, which often required a free translation. Furthermore, the texts have been annotated wherever it seemed to be necessary, providing further information and explanations. Animal and plant names have been scientifically specified and, if necessary, illustrated with pictures. The texts are classified in different sections, which nearly all are given with an introduction to the respective complex of themes and supplementary bibliographical references.